Starting the new school year is always an exciting time. Curriculum arriving in the mail, picking out new school supplies (don’t you just love the smell of those big pink erasers? ), and new littles “officially” starting school are a few of my favorite things about the new school year season. There is so much to look forward to with fresh starts and a full arsenal of ideas. However, I can tell you from experience that things can quickly go down hill if you aren’t prepared for the impending time commitments that will be required to get the new school year going (and staying) on track. Having an area or room all ready to go on the first day of the new year is crucial. Having an assigned place for workbooks, reading books, pens… everything, will definitely help your school year start on the right note. Labeled bins, boxes and carts are wonderful! I have this one and coordinate the days of the week with the color of the drawers so my preschoolers know which drawer to pull from each day. The coordinating hanging folder organizer is perfect to keep my lesson plans for each day too! 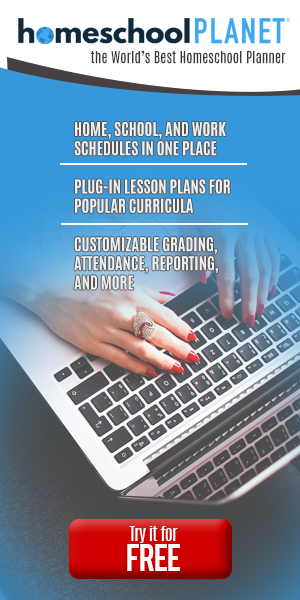 Whether you buy a box curriculum that tells you what you will need each week or create your own lessons… you will probably need a family/school planner. My favorite physical planner is the Well Planned Day. Donna Young also has a lot of (free) printable planning pages that I have used over the years… especially for high school. 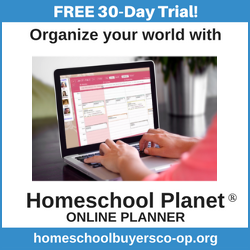 However, this year I’m using Homeschool Planet, an online planner. It is hands down the BEST online planner… ever. There’s nothing worse than the kids following me around all day asking, “What’s next?” “What do I do now?”. I’ve tried a rigid schedule.. didn’t work. I’ve tried a block schedule, it also didn’t’ work for use. So what I decided to do was write down what we actually did on a normal school day and I was able to come up with a working routine. NOT a schedule but rather a rhythm. I wrote it down on a white board like this one and hung it in the school room so everyone could see it. My favorite resource for working the details of said routine can be found over at Proverbial Homemaker. During the first few days (and weeks) of school, losing track of time every now and then will happen. My best defense for that is having a stocked freezer. That way when 4 o’clock hits and you realize you forgot to prepare, you can just grab a meal from the freezer and rest assured it will be done in about an hour! My absolute favorite cook book for this is Not Your Mother’s Make Ahead and Freeze Cookbook. Last but certainly not least… you need to pray for your homeschool. Why would I put prayer last on the list? Simple. It’s the one thing on the list that you should continuously do. Pray for His guidance and wisdom when it comes to curriculum and lessons. Pray over your children for open minds and teachable hearts. Pray for a verse of the year. Pray for the ability to keep your tone kind and remember that these little ones are a blessing entrusted to you by the Creator of the universe. Bible Based Homeschooling has a great 31 Days of Praying for Your Homeschool printable. Flourish has a comprehensive list of ways to pray for your homeschool. Proverbial Homemaker has a set of printable scripture cards. And the Road to 31 features a printable prayer calendar. I hope this list of five things to do before you start the new school year is helpful! Happy Schooling! I’m kind of afraid to admit that I don’t do any of this! Great ideas and suggestion though!